Please pm me if you get a no-payment situation. I'll take 250 and pay however you prefer. I received my cards this past week. Sadly I had been to busy to even look at them until last night. They are pretty nice indeed! I can't wait to pass them out - correction, I hope I don't have to hand ANY out, but since we live in Illinois, I know I will need them. Has anybody gotten any feedback from businesses you've gave them too?????? I got my cards last week, they are great. I am very pleased with them. I gave one to the manager at Meijers, asked her to pass it on up the chain of command for consideration before they make a decision about posting their store. I intend to do the same at other stores. Edited by wacker45acp, 04 November 2013 - 08:22 PM. Thanks again to everyone who has purchased cards, and shared their thoughts with the community. As I mentioned before I had a few orders of cards that were not completed for one reason or another. I have about 1000 cards all boxed up and ready to ship if anyone is interested. I am getting excited for my Illinois concealed carry course this weekend, and I plan to take some cards to share with my fellow classmates and the instructor. If anyone else is interested in getting some No Guns/No Money cards now is your chance. Send me a PM to reserve your cards and I'll send you payment details. Received my cards last week. They are top quality. Hope they aren't thrown in the trash can before I get out the door of the establishment. Shipped 6 more boxes of cards this morning. If your cards shipped I sent you a PM, if you didn't get aPM your cards will ship tomorrow morning. I have a few hundred cards left of any one else is interested. PM me for details if you are interested. Just got my shipment, these are a LOT nicer than I expected. I dread having to hand them out? Got mine; very nice. Thanks. Mine arrived in yesterday's mail! They lkook great! Exactly as advertised. Thank You! These will be added to my student packs for the classes that I have upcoming. The cards are really nice! I think I'll take my family for a nice dinner and deliver one with a receipt to the manager of the Old County Barffet in Arlington Heights... I noticed they put up an anti gun sign last time my kids wanted to eat there. It's tough to explain why your not going to eat at a desert wonderland to a 3 yo. These cards are excellent!!! Thanks for allowing us to use them in class. I owe you!!! See you in January! I did receive my cards on Friday and they are great! Very professional and snazzy looking. I received my cards today, they look great. I am glad I purchased some, well worth it! Like everyone else, I'm also impressed. "Those who think they know everything are really annoying to those of us who do." 700 down 2300 left. PM me to reserve yours. Thanks for you prompt response cjurczak...check will be in mail tomorrow. Do I hand out cards to all the airlines at O'hare? Maybe pass out a few to the TSA agents? Edited by narcoden, 16 November 2013 - 02:17 PM. Safe travels abroad! I am printing up USPS labels for all the orders I have so far. Monday I will packing up cards and shipping them out. If anyone wants to get some cards and have them shipped out Monday, let me know via PM. If you get your order paid by tonight I will get them in the mail Monday, and you should have them Wednesday. PM me for payment details (PayPal, Google Wallet, Bitcoin). Edited by cjurczak, 16 November 2013 - 02:59 PM. I received my order today. Just wanted to say thank you to cjurczak for coordinating the effort and all the details which go with that. The cards look great and will serve as a convenient/useful tool for those of us trying to make a difference in our neck of the woods. i to just received my order today. thanks cjurczak they look grate, so glad i ordered them from you. 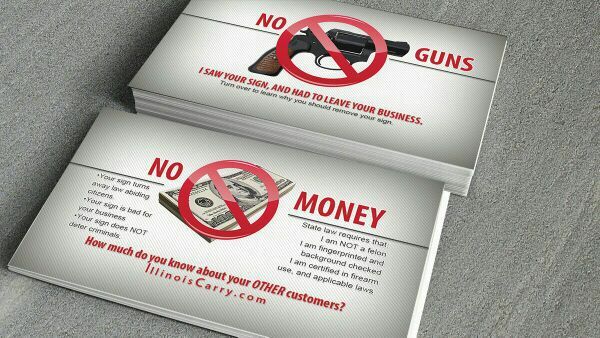 i hope i never have to pass them out, but hey this is Illinois, right. thanks again. Got mine today also, nice cards, and thanks for the lightening fast transaction. Fortunately in my area I haven't seen any posted signs yet but at least I'm ready. 550 of the bonus cards are gone. If you want to get in on the Friends and Family bonus cards please PM me to reserve your cards. If you ordered cards and have paid your cards ship tomorrow, any other orders will ship Friday morning. Any questions please shoot me a PM and I'll get back to you as soon as I can. Recived my cards last night. The cards are awesome, more people should get them to have them ready to use! Fast shipping and selling kept informed, thanks bro!